Planning a proposal is an extremely personal and emotional event — not to mention a pretty BIG deal. Once you’ve decided that you’re ready to spend the rest of your life with someone, the next step is figuring out how to pop the question. 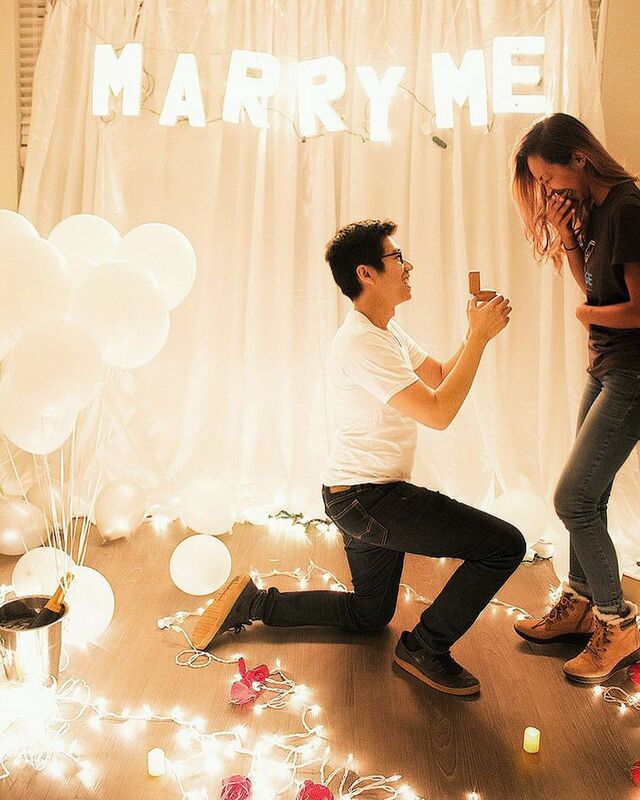 There are millions of romantic ways to propose, and “romantic” means something different to every couple, but whatever you choose should reflect you and your future fiancé(e). 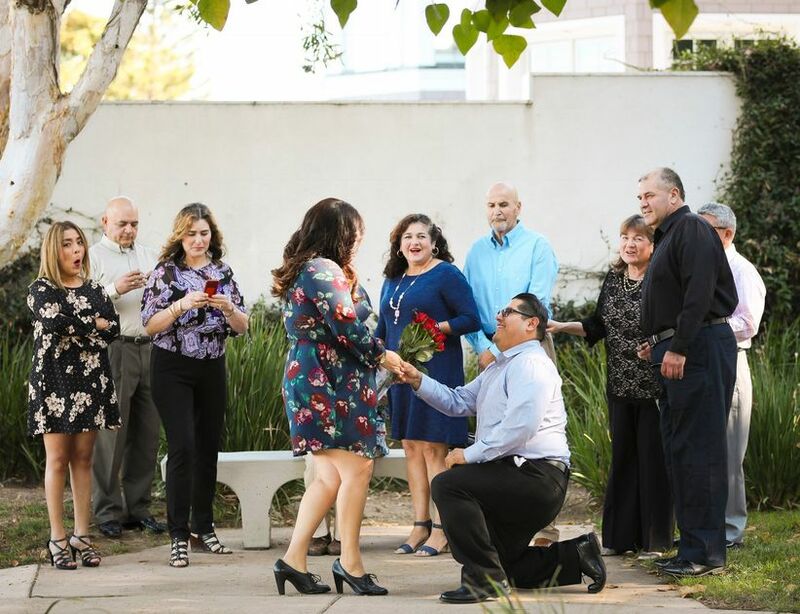 Whether it means a grand public gesture or a private moment between just the two of you, pulling off the perfect proposal can feel like a lot of pressure. But trust us, you’ve got this! Need a little help? These romantic ways to propose from real couples are a great source of reassurance and inspiration for your own engagement moment. Once you’re engaged, the excitement has only just begun! Starting November 1, 2018, you can share your proposal moment as part of WeddingWire’s annual #justsaidyes contest, which gives you a chance to win amazing prizes including $10,000 toward your wedding and monthly giveaways from Winc, The Black Tux, and Maggie Sottero. 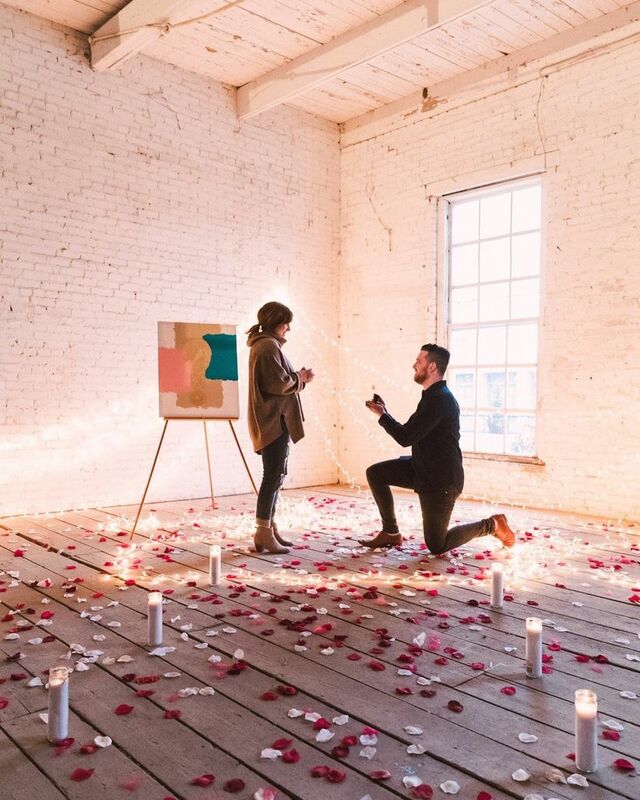 And don’t forget to follow @weddingwire and @justsaidyes on Instagram for even more proposal inspo! Start planning your special moment with these romantic ways to propose, inspired by real couples. It’s hard to go wrong with a proposal on the beach! 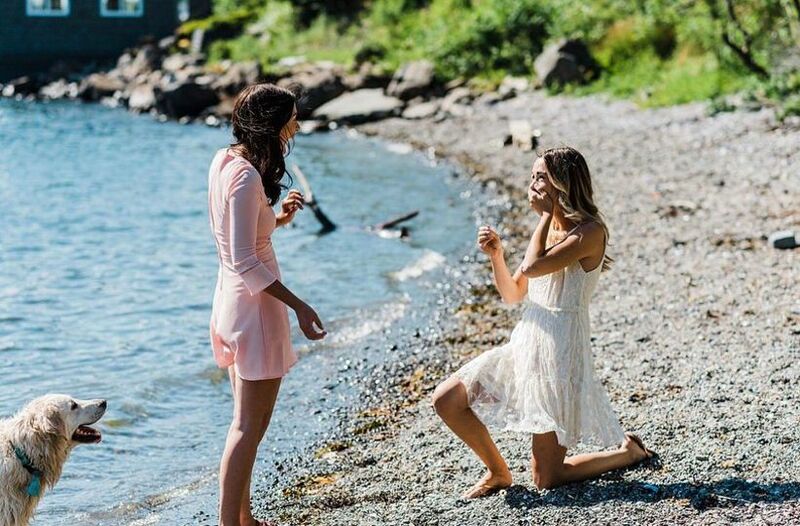 For your own #justsaidyes moment, choose a beach that holds special significance for the two of you as a couple, or start a new tradition by popping the question at a beach you haven’t visited before. 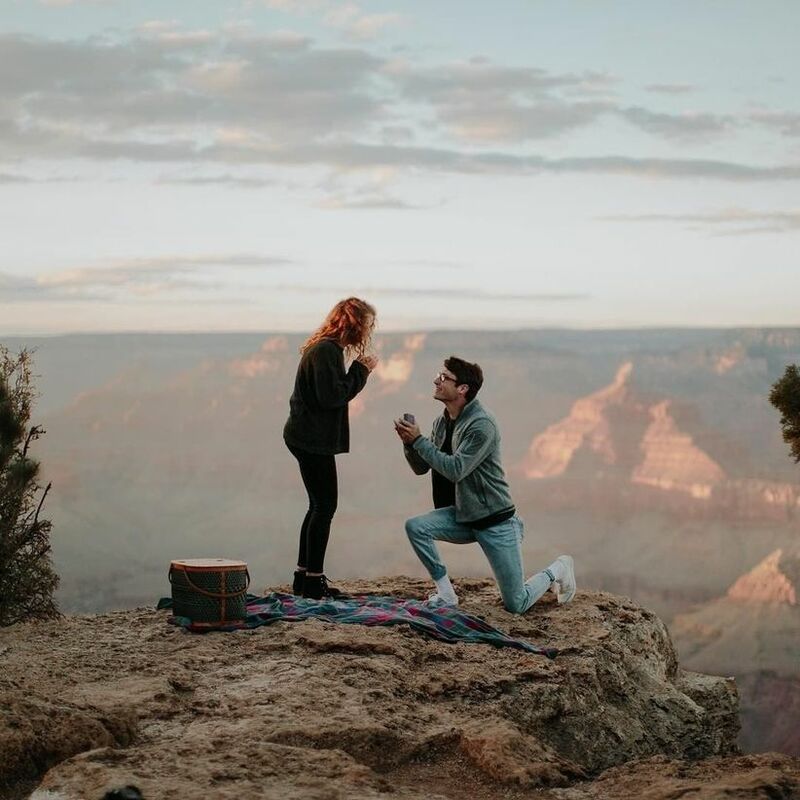 Whether you choose an iconic location like Horseshoe Bend or a spot away from the beaten path, you can’t top a proposal at the Grand Canyon. Make it even more memorable by planning the big moment for sunrise or sunset, or go all out with a private helicopter ride. There are dozens of romantic places to propose in NYC, but Central Park is at the top of the list. Even though the Big Apple is one of the busiest cities in the world, you can almost always find a private spot in Central Park if you wander long enough! 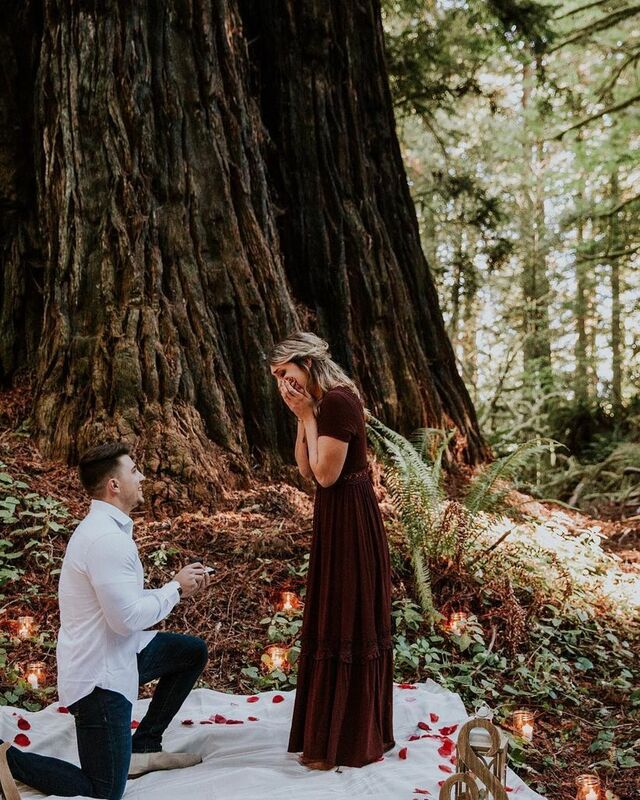 For a total fairytale moment, ask bae to marry you with the magical redwood forest as your backdrop. Even if you aren’t in the redwoods, any forest will do — it’s a seriously romantic way to propose, especially when you add a blanket with rose petals and votive candles. 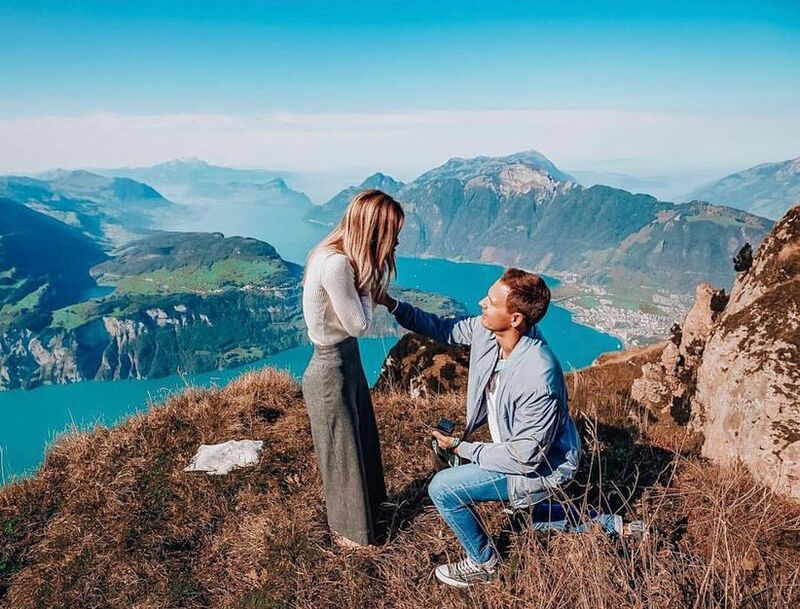 A trip through the Swiss Alps is an adventure of a lifetime, and it’s also a perfect opportunity if you’re looking for romantic ways to propose. In the winter, the mountains transform into a snowy wonderland, while the summer months bring wildflowers, waterfalls, and lush valleys. Top off your proposal by spending the night in one of the charming storybook villages in the Alps. There’s something classically romantic about going on a picnic with your love. 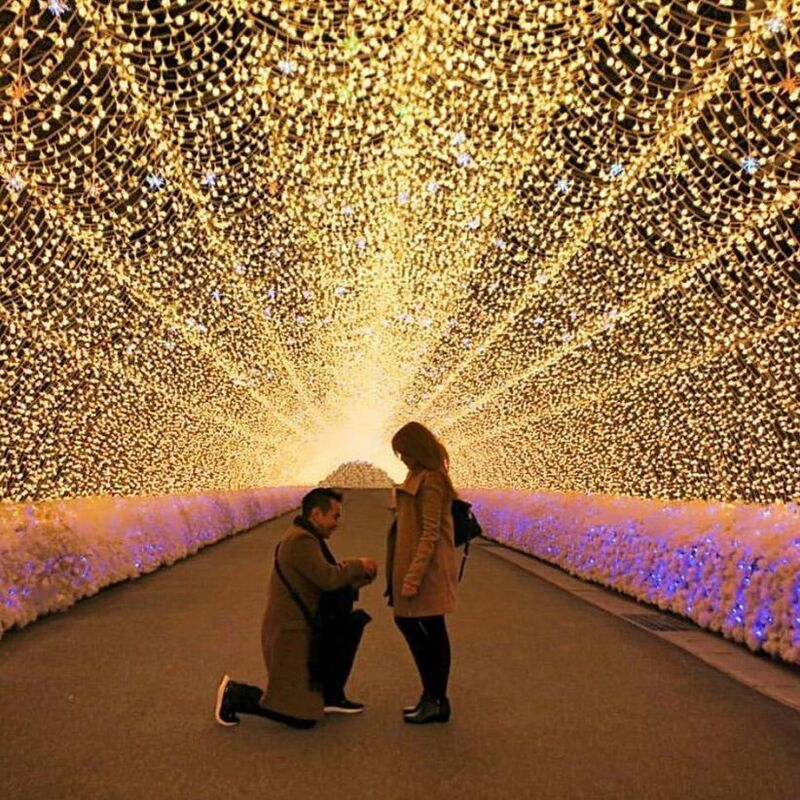 The best part about this proposal idea is that you can make it as elaborate or as simple as you want! 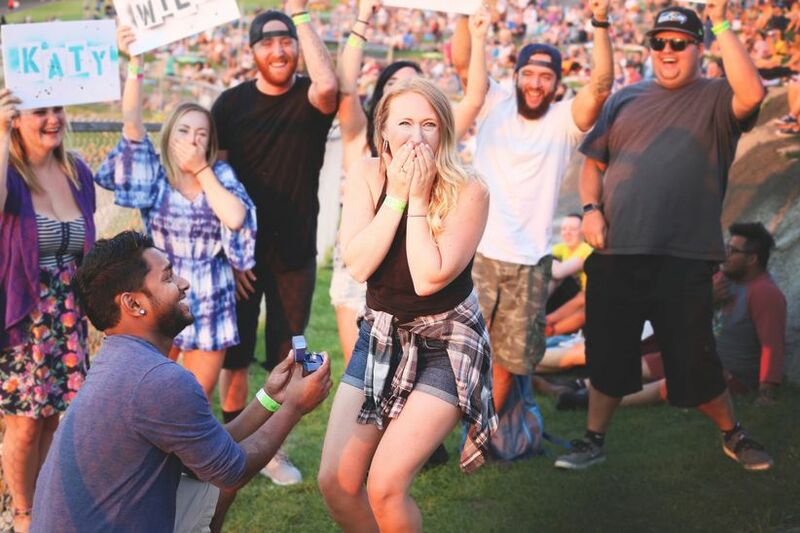 If you want to capture your proposal on film, live music (or another type of performance) provides an ideal opportunity to do so. You’ll have an excuse to get the camera rolling without completely revealing your plan. 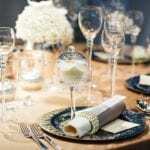 Plus, music will add to the ambience of the proposal! 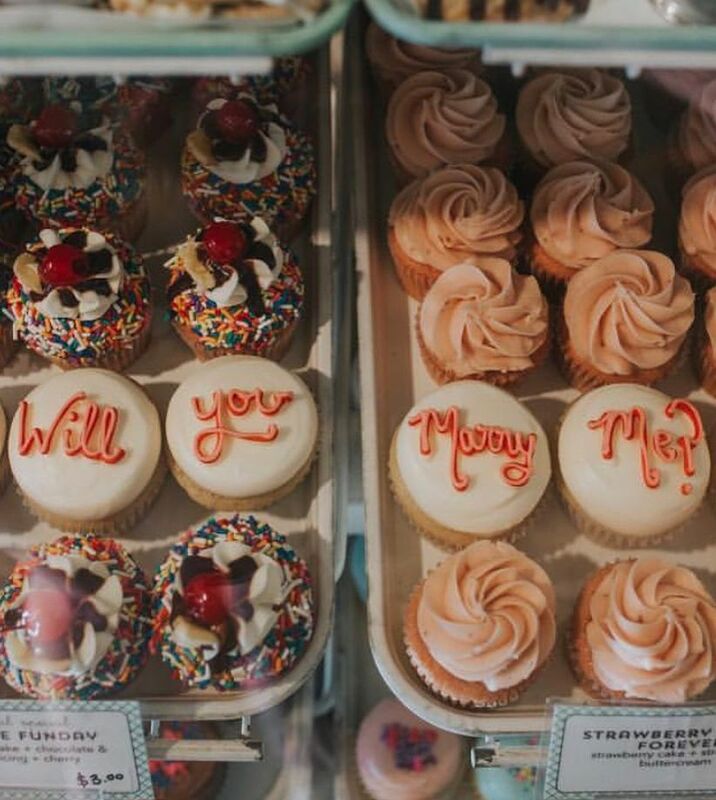 Behold, one of the most creative (and yummiest) romantic ways to propose: cupcakes! This idea requires a bit of coordination if you want to arrange something in advance with a bakery, but you could also put your own spin on it at home by making the cupcakes yourself. Enlist your best friends (or a group of willing strangers) to help you pull off the ultimate declaration of love by proposing in public. 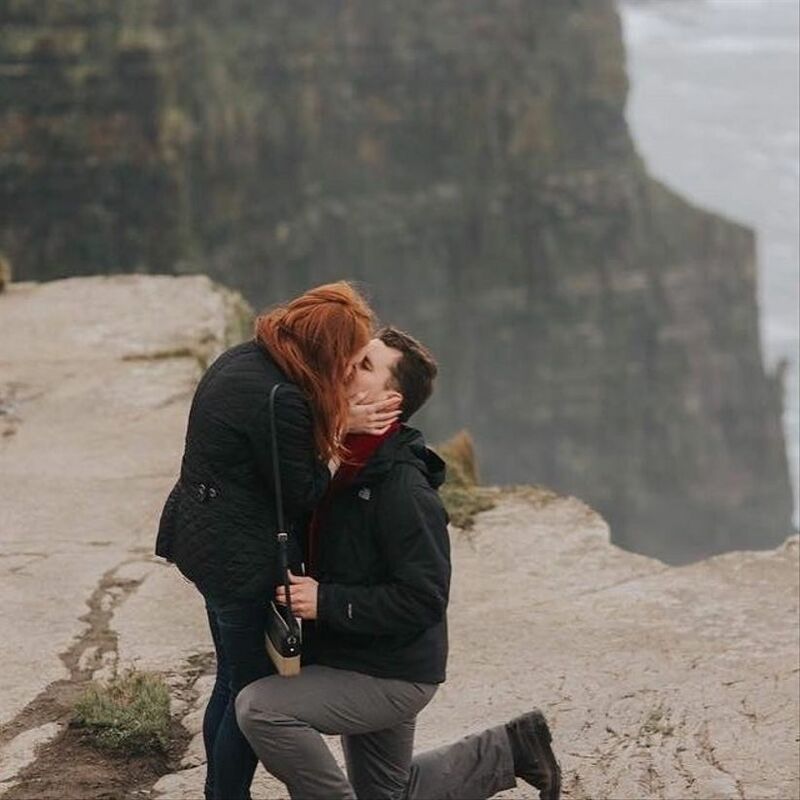 There’s nothing more exciting than announcing your engagement to your friends and family — except maybe having them there to witness the moment for themselves! 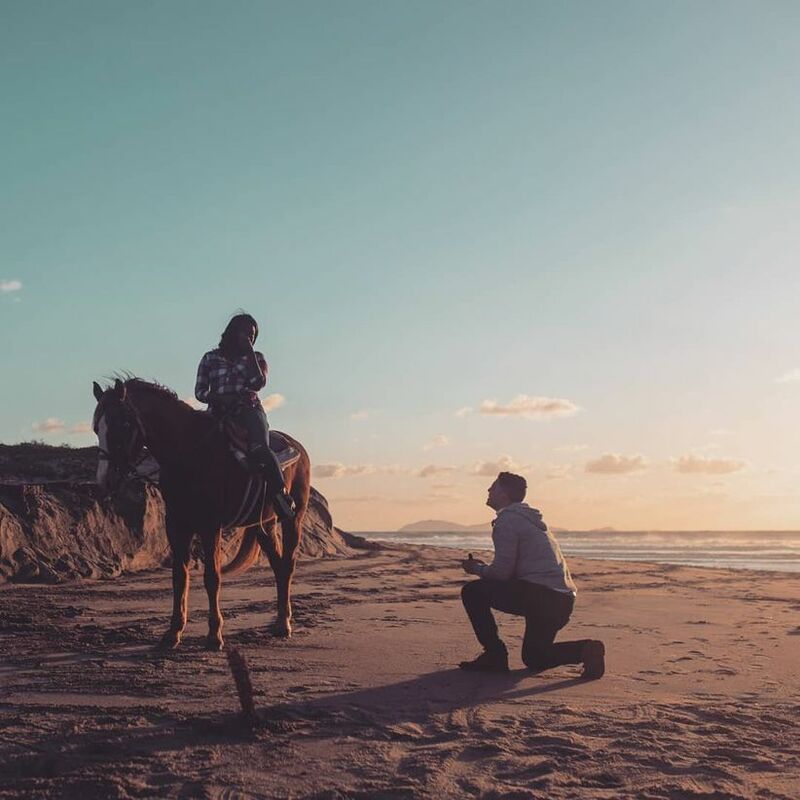 A proposal made this “pinch me” moment completely unforgettable (as if a horseback ride on the beach at sunset wasn’t romantic enough!). This idea isn’t for the faint of heart (or those with a fear of heights), but we can’t deny that asking your S.O. 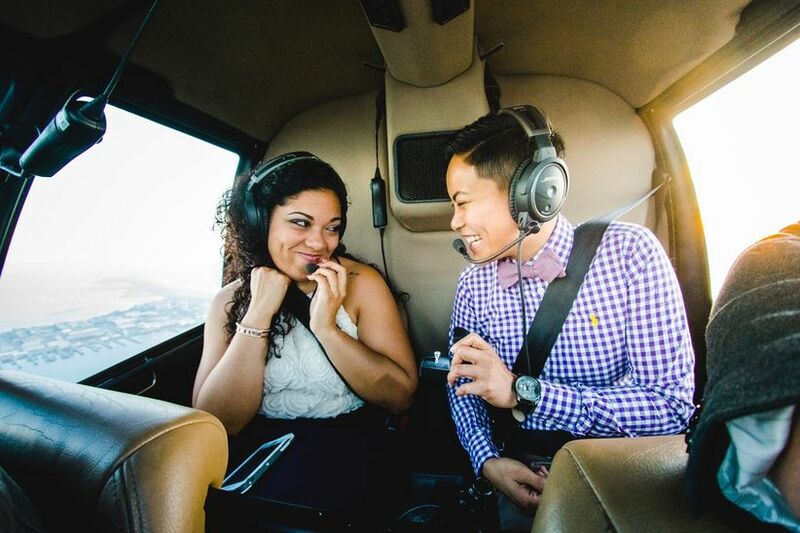 to marry you while soaring thousands of feet in the air is one of the most romantic ways to propose. This is the perfect idea for the sentimental couple. Create a sweet backdrop for your proposal by displaying all of the pictures you’ve taken together throughout your relationship. Aside from pictures, you could also use other special mementos, like love notes or ticket stubs. If you and your S.O. 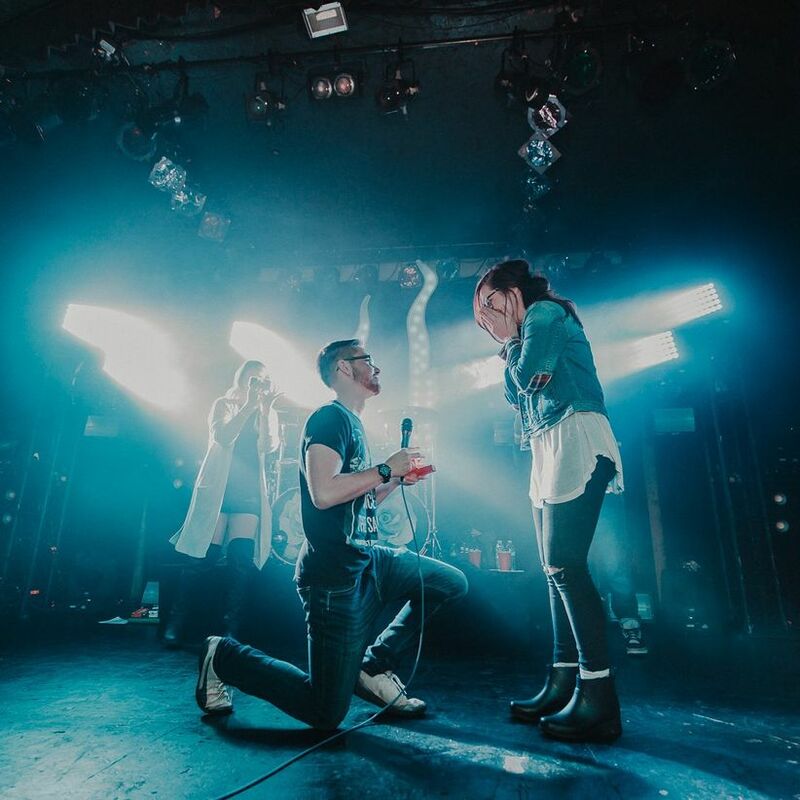 aren’t afraid of the spotlight, pop the question onstage at a concert. This of course takes a fair amount of coordination beforehand, and unless you have a connection to the performer, it could become complicated or downright impossible. But you don’t have to be onstage to make it a memorable moment — get tickets to see the first artist you saw in concert together, or propose during a special song that you both love. Outdoorsy couples, this idea is for you! 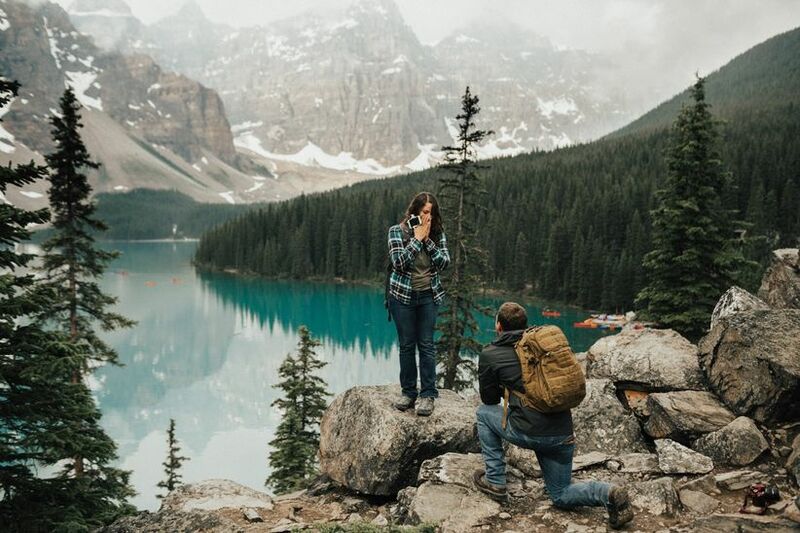 Pop the question during a hike to get the best of both worlds — privacy and a gorgeous setting. 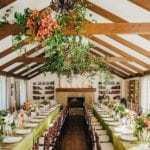 Create an enchanting proposal space by using rose petals and candles to make an aisle leading to the exact spot where you’ll get down on one knee. We love the halo of strand lights surrounding this couple. 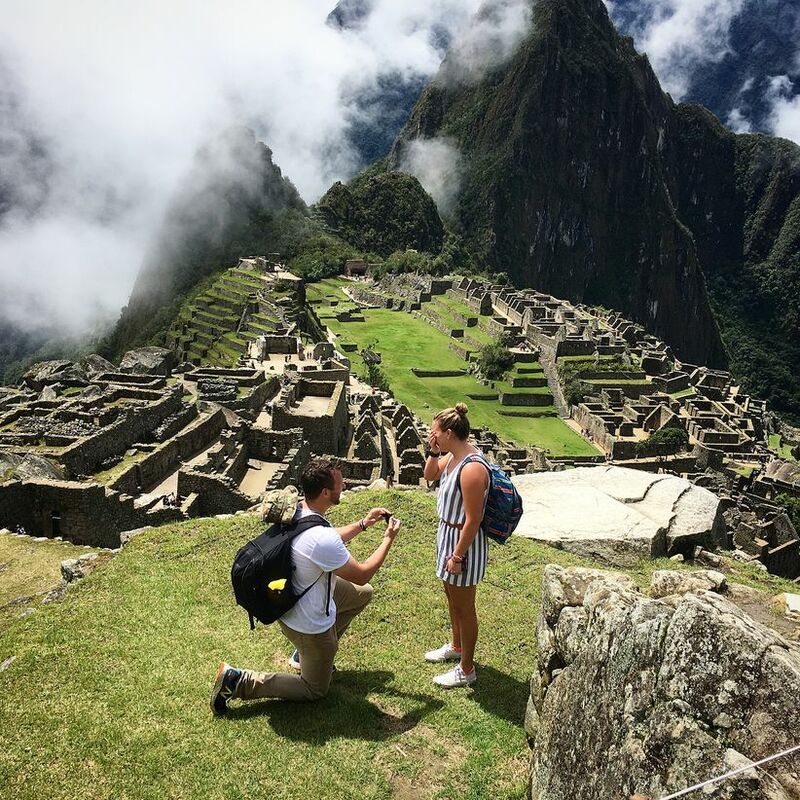 A failsafe option on our list of romantic ways to propose: visit one of the seven wonders of the world and surprise your S.O. with the question of a lifetime. This idea is perfect if you and your future spouse love spending time outdoors. Maybe you have a favorite hangout spot by the local river or a beach you visit together every summer. Choosing a place that holds special meaning for the two of you ensures that your proposal is personal and extra-sentimental. 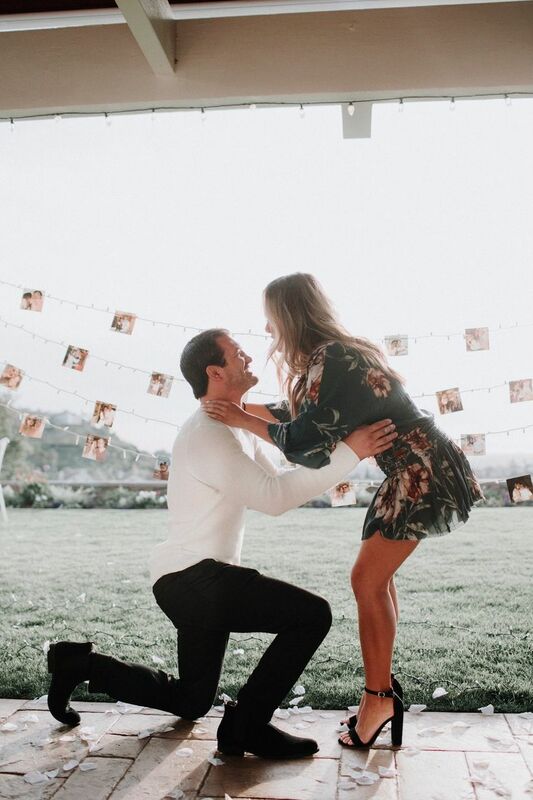 If all else fails, there’s always Lake Tahoe, which was the breathtaking location for this proposal that’s giving us all the feels. Sometimes, it’s the little details that make the biggest difference. This simple yet sweet setup with balloons and twinkle lights is oh-so romantic. Bonus points for having the champagne chilling ahead of time! 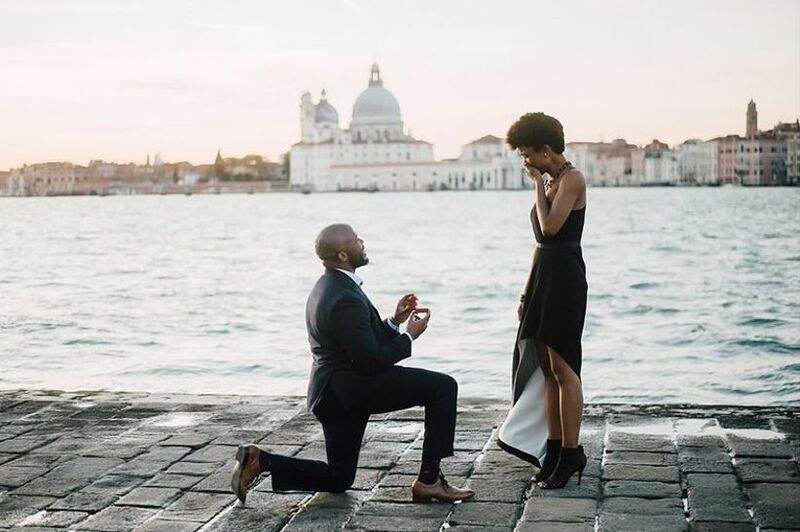 If you’re traveling to Italy with your S.O., it’s bound to be a romantic trip regardless of whether or not you propose. 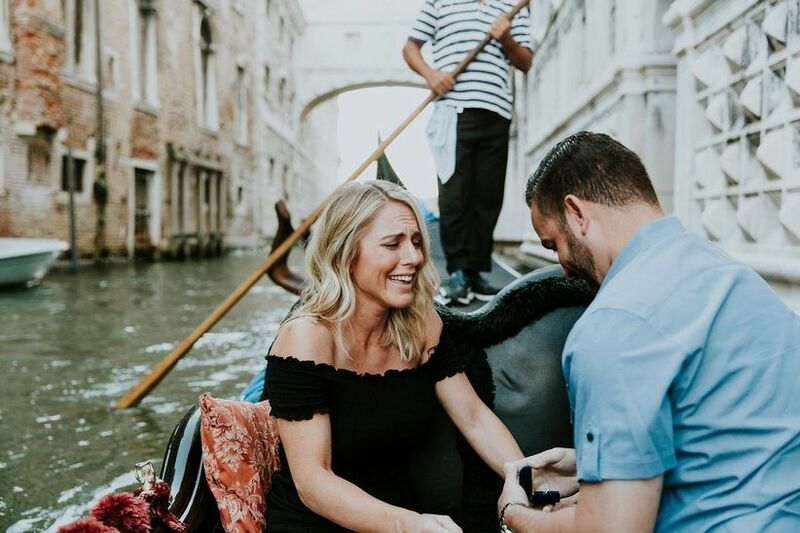 But if you want to totally sweep them off their feet, popping the question while cruising down the Grand Canal in Venice is definitely the way to go. 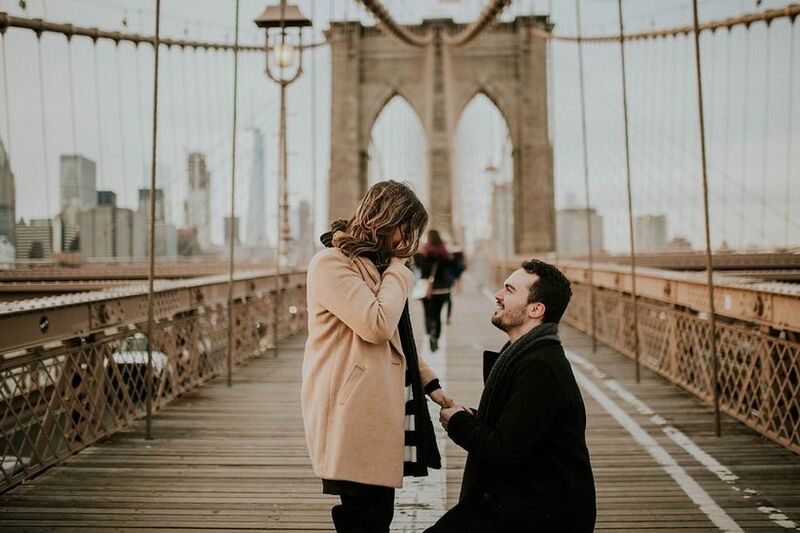 Whether you live in NYC or are just visiting, the Brooklyn Bridge is an excellent backdrop for a proposal. 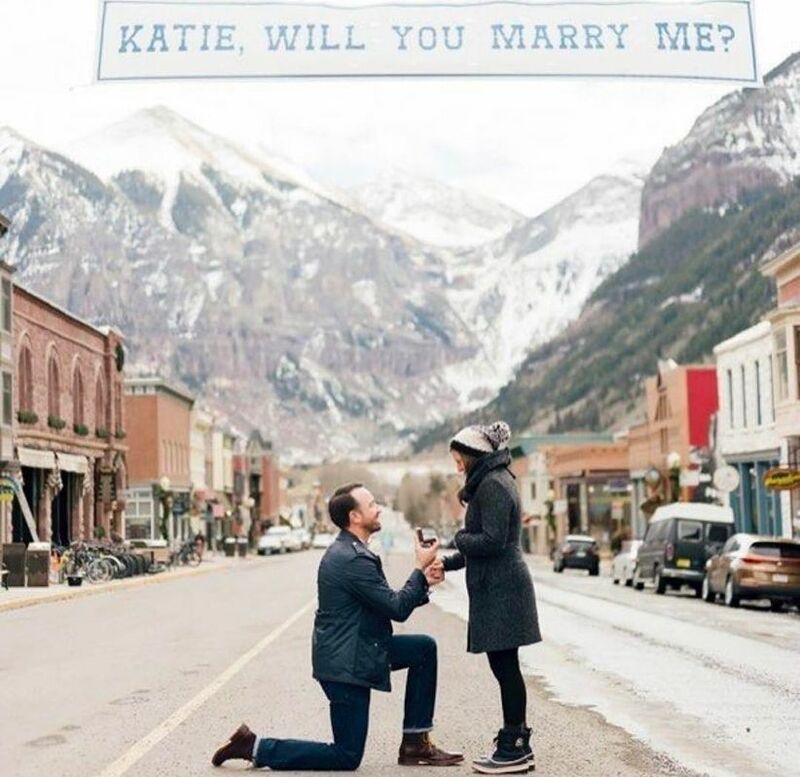 It’s also a great place for your proposal photographer to remain incognito and blend in with camera-wielding tourists until the big moment arrives. 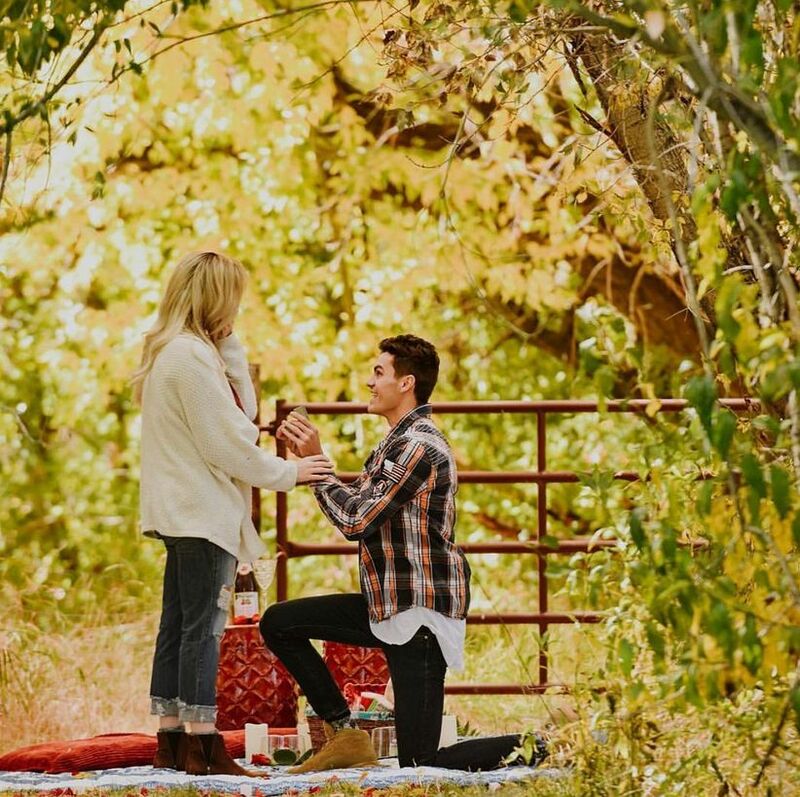 Sometimes the most romantic ways to propose include moments that are part of your everyday routine. 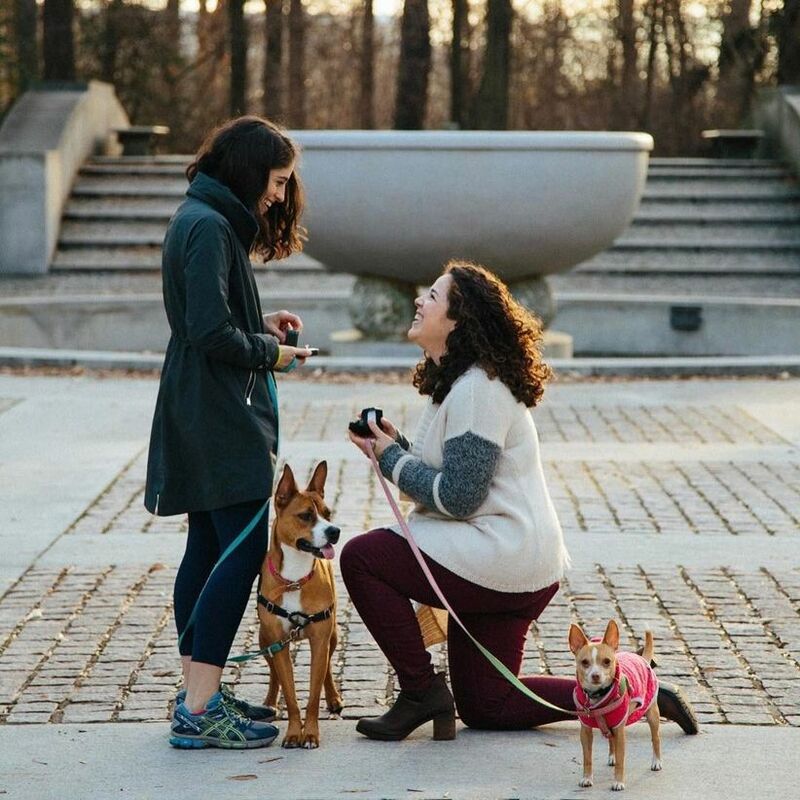 A stroll through your neighborhood or favorite park is a perfect opportunity to pop the question — even better if you have a furry friend with you! 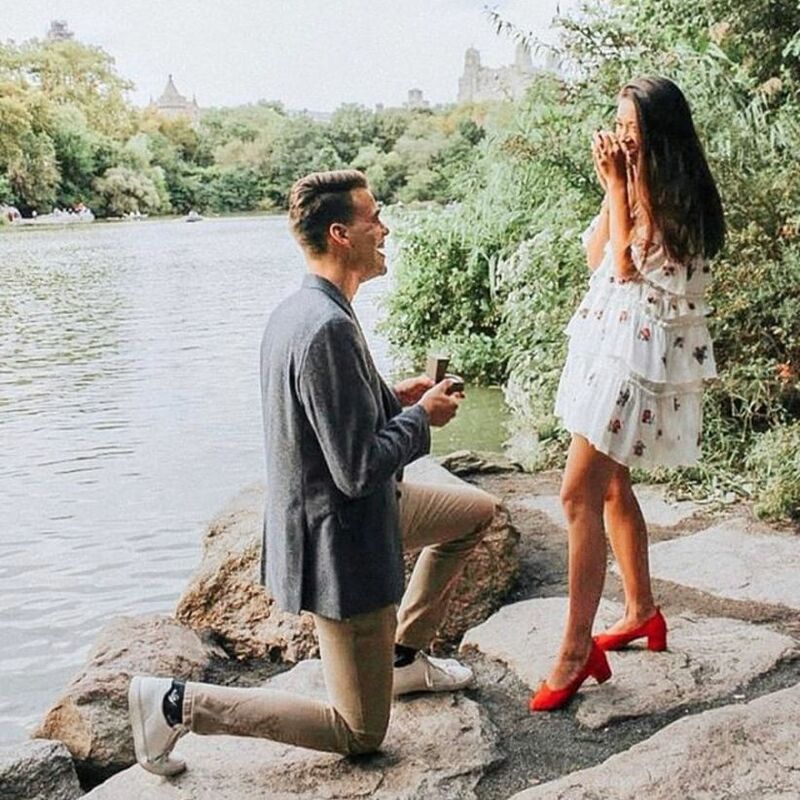 This adorable engagement took place on NYC’S Roosevelt Island and happened to be a double proposal — these two ladies were planning on proposing to each other at the same time! We can hardly contain our happy tears. If you’re proposing around the holidays, take advantage of seasonal backdrops and decor to create an unforgettable (and festive) moment. This gorgeous tunnel of lights is located in Japan, but you don’t have to travel to the opposite side of the world to pull off the same effect — a festival of lights or holiday market in your hometown is just as romantic. Even if you can barely stand on your own two feet, ice skating is always a fun date idea, especially around the holidays. Bringing your S.O. 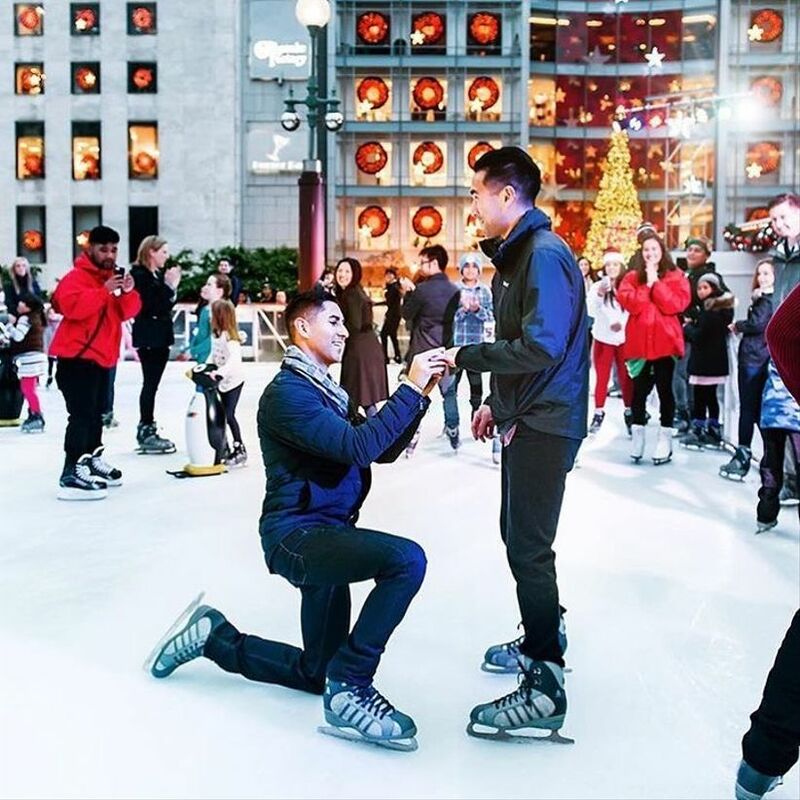 to the center of the rink and getting down on one knee is one of the most unforgettable romantic ways to propose. Just make sure they’re okay with being the center of attention! If you’re in a place with incredible scenery, catch your loved one off guard by setting up your camera and faking a “selfie moment” like this groom did! 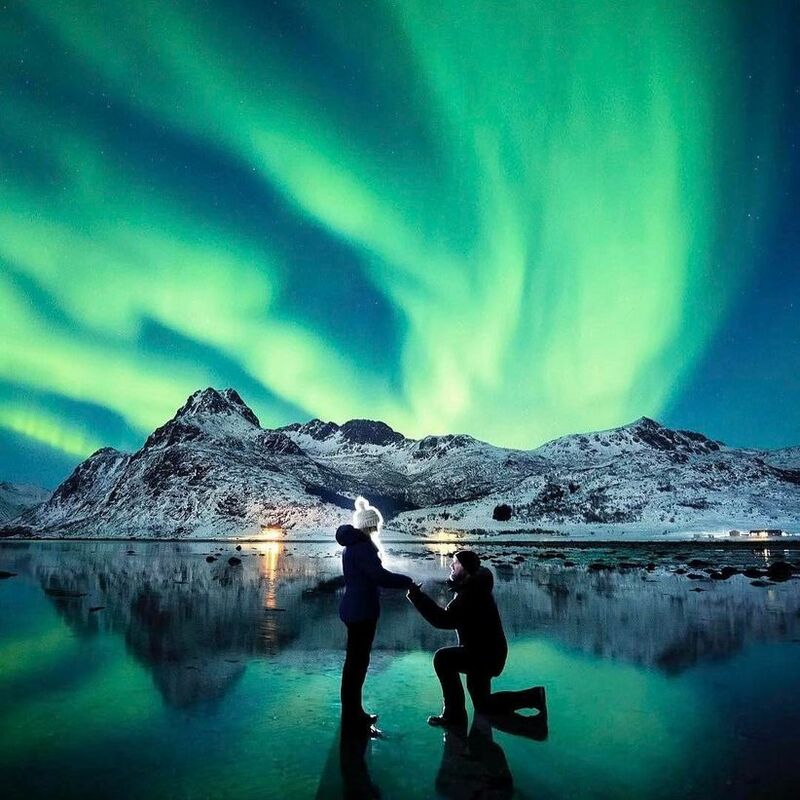 You can sometimes see the Northern Lights in parts of North America if you want to recreate this couple’s engagement, but stargazing or overlooking a city skyline would be equally romantic. There’s nothing like feeling on top of the world…when you’re actually on top of the world. 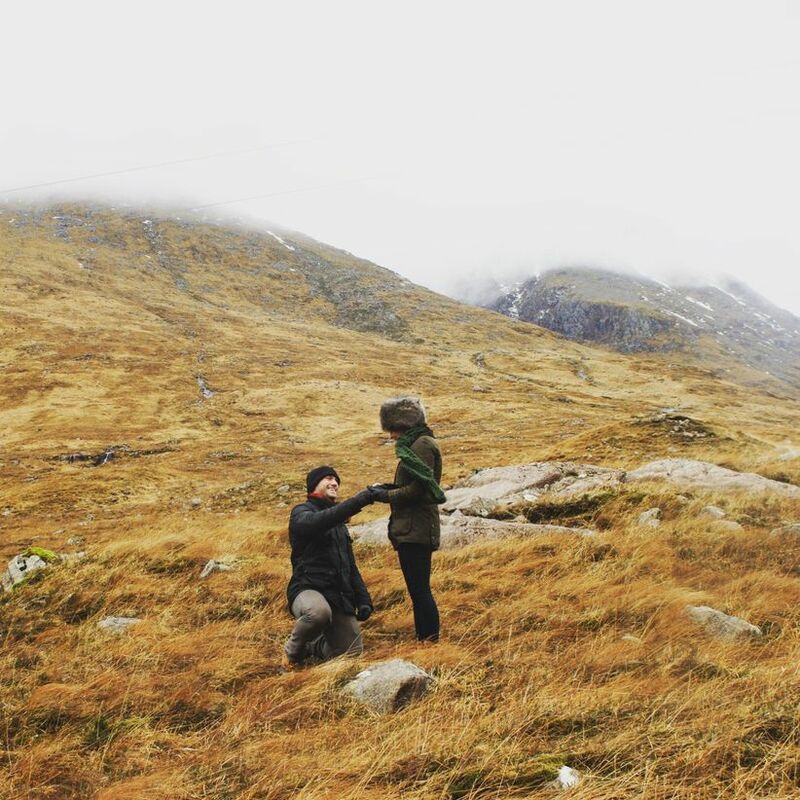 Proposing on a picturesque mountain or hilltop will give both of you the butterflies, and not just because of the view. This type of grand gesture is definitely not for the shy couple, but that’s why we love it! Let the whole world (or at least your town) know that you’re in love by asking your S.O. to marry you via a huge custom sign. 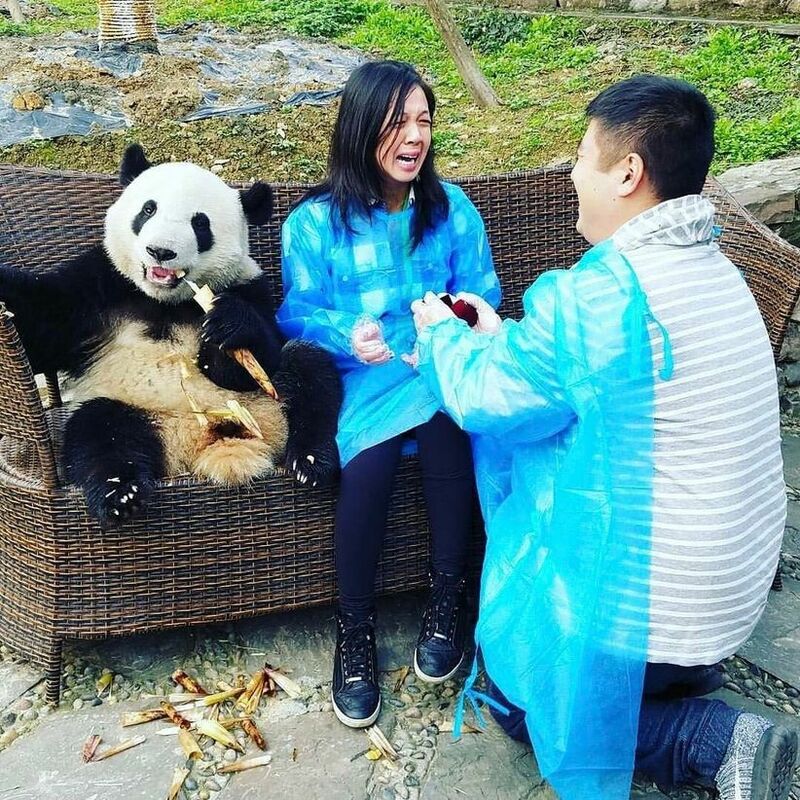 As if spending time with an actual panda bear wasn’t already amazing, this groom took a once-in-a-lifetime experience to the next level by proposing during the panda’s snack time. 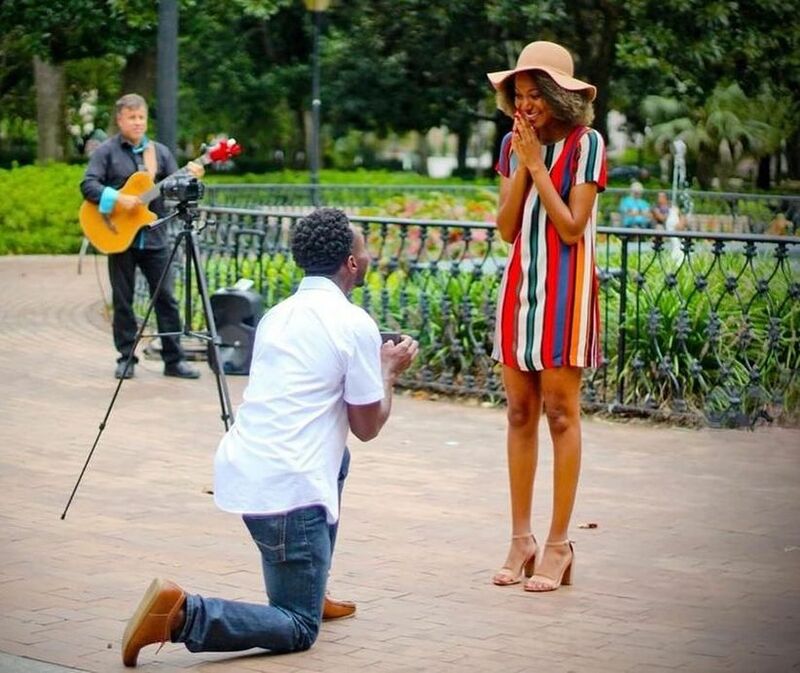 While you may not be able to entirely recreate this experience, let it inspire you to pop the question at a zoo, aquarium or farm, especially if your S.O. loves animals! 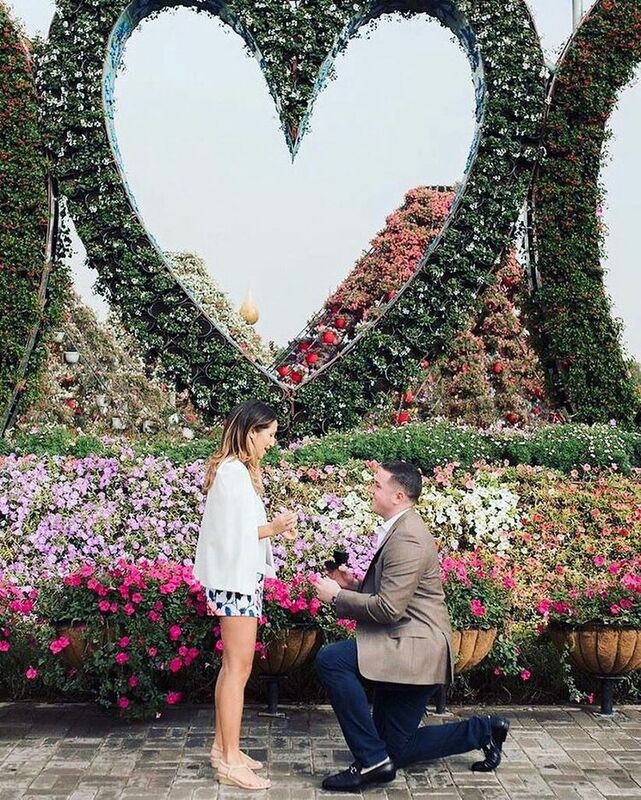 A flower-filled garden makes a gorgeous photo op for your proposal if you’re planning to capture the moment on camera. This romantic backdrop is located in Dubai, but you can check out historic estates or botanical gardens in your area for topiaries and colorful flower beds that will create a similar effect. Whether you’re traveling abroad or taking the cross-country road trip that you’ve always dreamed about, a big trip with your S.O. is a memorable time to propose. No need to worry about the post-vacay blues — you’ll be too busy basking in your engaged couple bliss! 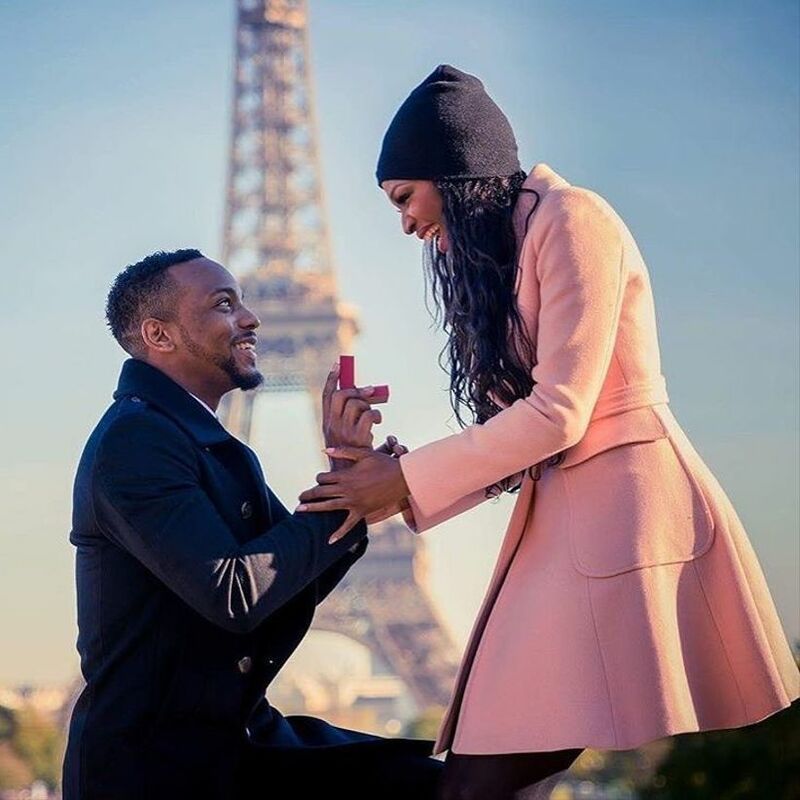 Getting engaged during a trip to Paris is one of the most romantic ways to propose. From the Pont des Arts to the Eiffel Tower, there are so many iconic backdrops in the City of Love that you practically can’t go wrong. Not able to make it all the way to Paris? Luckily, there are a handful of North American cities with European characteristics, such as Montreal, Washington, D.C. and New Orleans. Yes, it’s tradition in heterosexual relationships for a man to propose to a woman, but this is the 21st century, people! If you’re a girl who simply can’t wait any longer to get engaged, why not take matters into your own hands? You’ve found the one you want to spend your life with and shouldn’t feel the need to hold back because of taboos. 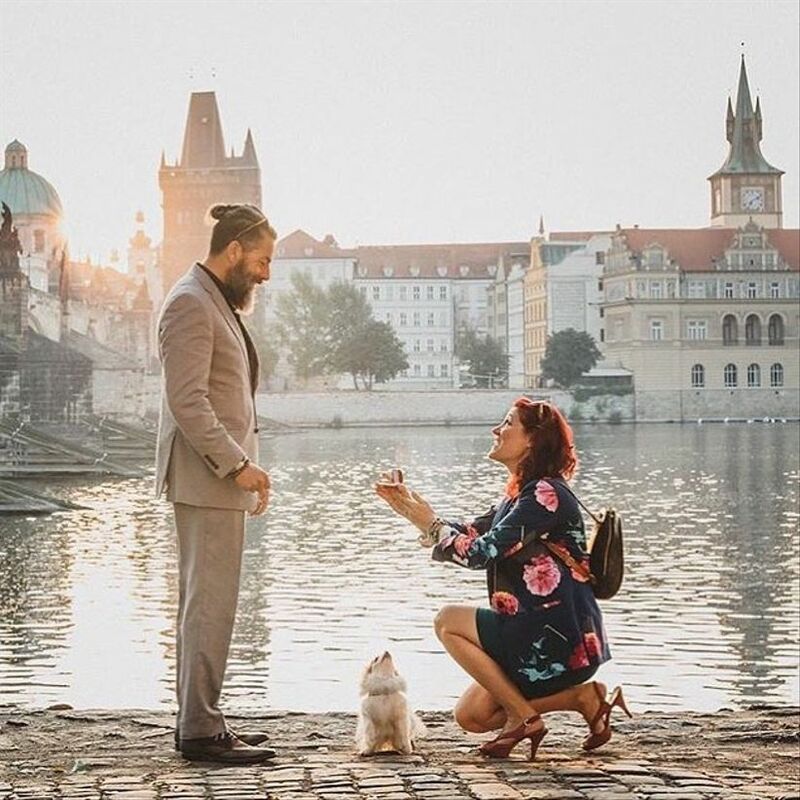 Proposing as a woman is a romantic gesture that shows that you’re confident and open-minded — two amazing qualities that are an important foundation for any relationship.